A number of candidates running for parliament membership from various cities such as Malatya and Edirne have signed the LGBTI Rights Pledge. The human rights organization SPoD LGBTI had formulated the open pledge and asked candidates to publicly sign it. 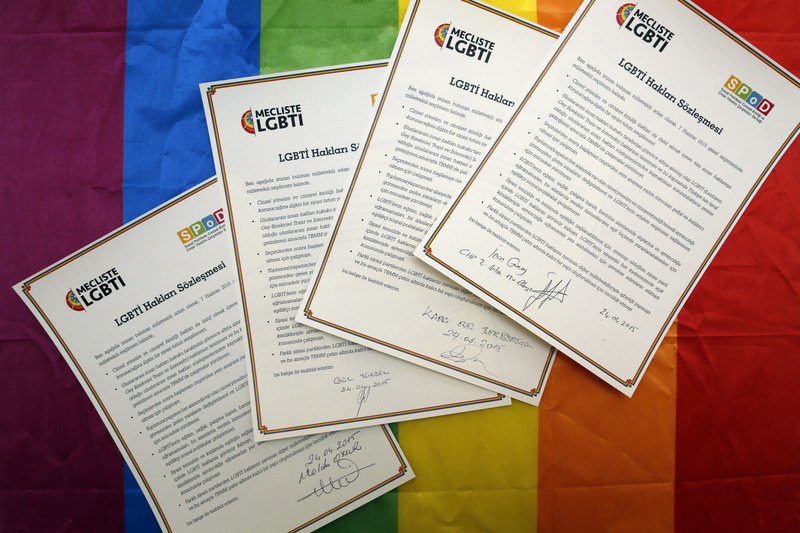 By signing the aforementioned pledge, the candidates promised to defend LGBTI rights in the parliament. The LGBTI Rights Pledge was made public for MP candidates’ signatures prior to the general elections of June 7 by the Social Policy, Gender Identity, and Sexual Orientation Studies Association (SPoD LGBTI) and has thus far received the signatures of 33 candidates. The pledge was proposed as part of the LGBTIs in the Parliament campaign, whose aim was to increase the visibility of human rights violations suffered by LGBTI individuals and to create a society where no individual faces oppression due to their identities. Women from the HDP [Peoples’ Democratic Party] were the first candidates to sign the pledge as they declared “We are the rainbow.” Recently, new signatures were added to the pledge. Representatives from SPoD LGBTI were in Ankara on April 28-29 to present the LGBTI Rights Pledge to politicians. Selina Doğan, the CHP’s [Republican People’s Party] first rank candidate from the second district of Istanbul, signed the pledge in addition to Zelal Deniz Demir, the HDP candidate from Ankara, Aylin Nazlıaka, the CHP candidate from Ankara, and Selin Sayek, the CHP first rank candidate from Izmir’s second district. SPoD LGBTI representatives, who have started the “LGBTI in the Parliament” campaign for the active inclusion of LGBTIs in decision- and policy-making processes and who drafted the LGBTI Rights Pledge, asked candidates for parliament to advocate for LGBTI rights in the Parliament. In the coming days, candidates from other cities and parties are expected to sign the LGBTI Rights Pledge. As lesbian, gay, bisexual, trans and intersex (LGBTI) individuals living in Turkey, we experience social prejudice and discriminatory policies due to our sexual orientation and/or gender identity in access to health care, housing, education, employment and other areas of life. Our country’s constitution and laws either ignore or fuel discrimination based on sexual orientation and gender identity. Despite international agreements Turkey is party to, our country still does not recognize LGBTIs as equal citizens. Hate crimes and violence that target LGBTI individuals rise every day. Social pressure and discrimination lead many of our friends to suicide. The LGBTI rights movement of more than twenty years in Turkey continues its work to ensure that LGBTIs live in a just society as equal and free individuals and the ability to exist in all aspects of social life freely. As part of this movement, we believe that the solution to LGBTIs problems can only be possible when LGBTIs can use all of their political rights, including the right to vote and be elected with their open LGBTI identity. We think the presence of LGBTIs in politics carries great importance to actualize LGBTIs right to life, health care, housing, and employment. We see the 10% election threshold in Turkey’s election system as one of most fundamental obstacles to democratic and just representation. Like other disadvantaged groups facing discrimination because of the lack of justice in representation, we argue that the direct participation of LGBTIs in decision-making mechanisms is a non-negotiable part of democratization. Policy suggestions for LGBTI rights and freedoms should be part of election campaigns. All impediments to LGBTI political participation should be lifted. The necessary precautions must be taken to ensure that LGBTIs serve in all levels of the political establishment with their open LGBTI identity. Steps must be taken to actualize rights-based social policies. Election campaigns should share with the public plans to ensure that LGBTIs have equal access to education, health care, housing, employment, retirement, senior citizens’ rights, income support and other social policies. Steps must be taken to ensure that the new Constitution drafting process be a transparent and participatory one. Approaches to the protection of all human rights, including LGBTI rights, must be shared with the public. Cooperation with the LGBTI movement to actualize LGBTI rights must be established.